Weebly is a popular drag and drop website builder used by millions of people around the world. Just like WordPress it can be used to create personal or business websites, has blog feature and it simple to use. By default, Weebly websites are hosted on a subdomain under weebly.com, however it is also possible to use top level domain name with Weebly. 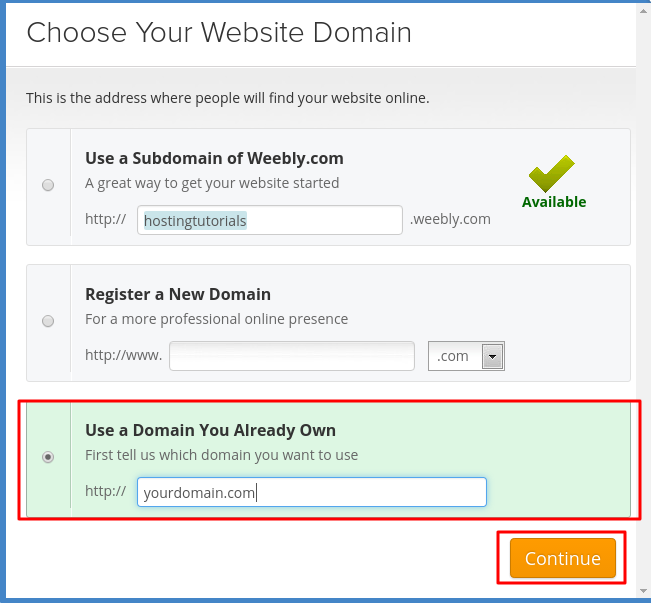 In this tutorial you will find out how to point domain name to Weebly. In your hosting control panel locate and access DNS Zone Editor section. Select appropriate domain name from the drop down list. You can skip this step if you have only one domain name. Locate your domain’s A record and hit Edit button. Replace current value in Address field with 199.34.228.59 (it is Weebly’s IP address) and hit Edit Record button. The hard part is over! You just pointed domain name to Weebly. However, note that it can take up to 48 hours for DNS changes to fully propagate worldwide. Access Weebly editor and press Settings tab which is located at the top of the page. On Site Address section press Change button. A new pop-up window will appear. Select Use a Domain You Already Own option, enter your domain name in the field and press Continue button. Your domain name is now connected to Weebly. If you experienced any issues following this tutorial, contact your hosting support staff and they will gladly help you to point domain name to Weebly. You just finished this short tutorial and learned how to point domain to Weebly website. Once DNS propgation is complete, your domain name will display a website created with Weebly website builder.